As you can see from the results posted to the “Smart Voter” website despite having a Republican opponent Congressman Campbell still managed to break 50% in the primary. As always thanks to Meridian-Pacific for the use of their map. Kang is from Irvine, the largest city in the 45th Congressional District but unfortunately for him John Campbell also is from Irvine. With a 20% Asian population in CD 45 you could make the argument that Kang will be one of the more competitive candidates in years. I would argue that party affiliation is more important when running for partisan office. The fundraising tells a similar story with John Campbell at over $1,000,000 cash on hand after the primary election and Sukhee Kang having under $250,000 cash on hand. This is over a 4:1 ratio for the sitting Congressman. 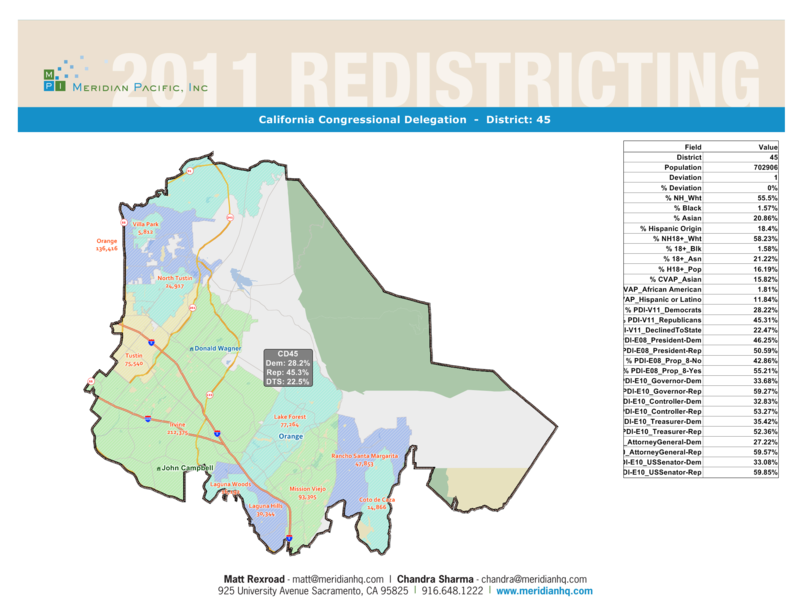 This entry was posted on September 11, 2012 at 10:47 AM	and is filed under 45th Congressional District. Tagged: John Campbell, John Webb, Sukhee Kang. You can follow any responses to this entry through the RSS 2.0 feed. You can leave a response, or trackback from your own site.